Accolades for "The New Rules of Green Marketing"
The New Rules of Green Marketing was recently named a Top 40 Sustainability Book by the Cambridge Program for Sustainability Leadership. The book shares the honor with others written by sustainability giants such as Al Gore, Muhammad Yunus, and the Prince of Wales. To celebrate this wonderful accomplishment, both publishers have offered 40% discounts on the book. Please click here for more info. Scroll down to the bottom of the book page to view. 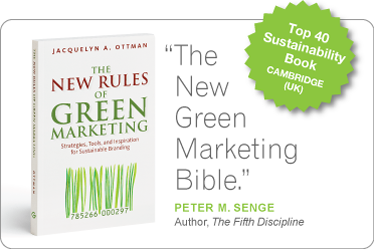 Stellar Reviews "For The New Rules of Green Marketing"
"Ottman intended this book to be a 'useful resource, practical guide, and source of ongoing inspiration' and her product certainly delivers." "Ottman's rules transcend "green marketing" to "good marketing". I'd recommend this book to anyone in the profession picking this book up, pouring yourself a cup of tea, and immersing yourself in a fine read that will leave you energized about our craft and with tools to create better brands in an ever-changing world." "...a green marketing bible full of wisdom..."
"Whether you are a sustainability director, a brand executive, entrepreneur or venture capitalist, a professor or a student—or whoever else—its insightful tools will serve as a valuable and enlightening resource." "Looking for the be all and end all of green marketing? Need a green marketing bible? Jacquie Ottman's new book, "The New Rules of Green Marketing" takes a comprehensive look at the future of how companies can respond to the needs of a rapidly evolving green consumer marketplace." "The essential and game-changing book"
"The New Rules of Green Marketing appears to be the first book to combine both a complete overview of consumers, the media, the marketplace and the urgency of sustainability with a complete "how-to" approach useful for anyone desiring to change their business culture and think through what needs to change. Transparency, truth and trust matter to me and this book communicates those values on every page." "Ottman's book (contains) something new and useful for even the most seasoned green marketers, and New Rules should be on all marketers' book shelves." "...the definitive text for any organization that is looking to brand itself or its products as green or sustainable. Jacquie's innovation driven insights will help organizations derive real and genuine strategic advantage from their green marketing initiatives." Director, Global Environmental Performance, Steelcase Inc.
"Jacquie has been on the forefront of helping industries, companies, and marketers understand how the evolution of our culture to a more green society will impact them. I had the opportunity to leverage her tremendous experience and expertise in the field on a recent project. This book will become a key reference "rule book" for anyone who wants to participate in this new Green World reality." Director, New Brand Initiative, BISSELL Homecare Inc.
"Jacquie takes her 25 years of experience in Green Marketing and gives insightful data and helpful checklists for practitioners in the field. The demand for green products is mainstream...and companies better be paying attention! " "Hurrah for this book showing how going green pays off in delivering a triple bottom line – profits, people, and planet." "Well written clear, informative and useful. It is also up to date and authoritative." "..Jacquelyn Ottman has been and still is the undisputable #1 advocate of the green marketing concept, pointing us at the absolute necessity to develop greener products and services that enable consumers to adopt a more sustainable lifestyle...The New Rules of Green Marketing" supplies us with her valuable up-to-date insights, including the opportunities of green branding. A must for all product design and marketing students and professors as well as the product industry." "In the "The New Rules of Green Marketing," Ottman demonstrates, once again, that her insights are on the leading edge of green business. Her strategies are practical, credible, and should be followed by any marketer that wants to profit from addressing green consumers needs today. We will be sure to recommend this book to our clients." 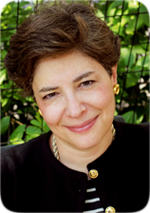 President, Natural Capitalism, and Author of "Climate Capitalism"
"...Jacquie has written the definitive book on the subject. People will be referring to these 20 rules for at least the next 20 years." Author, "The Green Marketing Manifesto" and "Co-Opportunity"
"I like it—The strength of "The New Rules of Green Marketing" is in the examples!." "While finger-pointing and blaming is still popular and prevailing, The New Rules of Green Marketing" demonstrates forcefully what the true underlying trend is and how a forward-thinking vision can be grounded in professional and creative activities leading to a different future." "GREEN is good. The New Rules of Green Marketing" should be the compass for the business navigating to the odyssey of sustainability." "Whether you're a start-up or C-Level executive, you will find Ottman's book a reliable compass into this fast growing and sometimes green grab bag arena." "Jacquie has done it again with her "New Rules of Green Marketing" book. 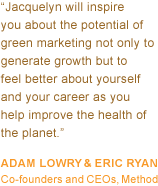 For green marketing practitioners, this is a must-have resource for insightful commentary on green marketing tips, strategies, and a plethora of real-life examples and case studies. Jacquie’s encyclopedic knowledge of green marketing campaigns, and her careful analysis of what works and what can be improved, makes this an important reference tool for anyone in the green marketing space. And, more importantly, her “New Rules Checklists" at the end of each chapter provide a fabulous starting point for framing out your own green marketing campaign. " "You need to read, no, wait, "own" "The New Rules of Green Marketing". It will give you an immediate jump on your competition through its encapsulation of decades of proven green marketing experience combined with current and relevant resources.". " "Jacquie packs the same sage advice she's been giving to the USDA's BioPreferred program—and more—into this extremely well-written and timely book. She has been leading the green marketing movement. Everyone who wants to participate in the sustainability space should read this book."